NSF’s Science and Engineering Indicators 2018 report released by NSB. R&D expenditures reflect a nation’s commitment to expanding capabilities in S&T, which in turn drive innovation. While the U.S. led the world in R&D expenditures at $496 billion (26 percent share of the global total), China was a decisive second at 21 percent ($408 billion). China has grown its R&D spending rapidly since 2000, at an average of 18 percent annually. Its focus is geared primarily toward development rather than basic or applied research. During the same time frame, U.S. R&D spending grew by only 4 percent. Although emerging economies start at a lower base and therefore tend to grow much more rapidly, China’s growth rate is exceptional. Knowledge and technology-intensive industries — in which S&T advances are key inputs — are a major part of the global economy, comprising nearly one-third of world gross domestic product (GDP). America leads in providing business, financial and information services, accounting for 31 percent of the global share, followed by the European Union (EU) at 21 percent. China is the third largest producer of these services (17 percent global share) and continues to grow at a far faster rate (19 percent annual growth) than the U.S. and other developed countries. The U.S. is the largest producer of high-technology manufacturing (31 percent global share). This includes production of aircraft and spacecraft, semiconductors, computers, pharmaceuticals, and measuring and control instruments. China is second at 24 percent, more than doubling its share over the last decade. Higher education provides the advanced work skills needed in an increasingly knowledge-intensive global economy. According to the most recent estimates, the U.S. awarded the largest number of S&E doctoral degrees (40,000) of any country, followed by China (34,000), Russia (19,000), Germany (15,000), the United Kingdom (14,000) and India (13,000). In contrast, the U.S. lags in bachelor’s level degrees. India earned 25 percent of the more than 7.5 million awarded S&E bachelor’s level degrees in 2014, followed closely by China (22 percent), the EU (12 percent) and the U.S. (10 percent). Nearly half of all degrees awarded in China are in S&E fields. Since 2000, the number of S&E bachelor’s degrees awarded in China has gone up by 300 percent. The business sector is by far the largest performer of R&D in the U.S., accounting for 72 percent of the $495 billion total in 2015. For several years, the annual rise in business R&D performance has accounted for most of the growth in overall U.S. R&D. Of the three main types of R&D — basic research, applied research and experimental development — businesses lead in both applied research (58 percent of $97 billion total) and experimental development (88 percent of $314 billion total). Higher education institutions continue to perform the largest share of U.S. basic research (49 percent of $83 billion total). The business sector also leads in R&D investment, providing 67 percent ($333 billion) of the national total in 2015. In contrast, the federal government — which was once the primary funder of R&D (67 percent in 1964) — reached a historic low in 2015, funding 24 percent of the U.S. total. This decline has primarily been due to the faster growth in R&D investment by the business sector. In addition, federally funded R&D has been on a declining trend since 2011 (from $127 billion in 2011 to $120 billion in 2015). “What is clear from Indicatorsis that even though there is a rise in many emerging economies, there’s also more specialization areas emerging as top fields,” said Geraldine Richmond, Chair of NSB’s Science and Engineering Policy Committee and Presidential Chair and Professor Chemistry at the University of Oregon. echnologies — including digital communications, semiconductors, telecommunications and optics — are mainstays of South Korea and China. “From my own experience working with a number of developing countries, I think one of our strengths is our ability to educate students to solve problems. Our innovations and patents really reflect that U.S. creativity remains one of our biggest assets,” said Richmond. At the same time, the world’s scientists are increasingly collaborative in their research endeavors. Among the major producers of S&E publications, the United Kingdom had the highest international collaboration rate (57 percent) in 2016, followed by France (55 percent) and Germany (51 percent). The U.S. followed with a 37 percent international collaboration rate, up 12 percent from 2006. The impact of S&E publications has also become more global. Between 2004 and 2014, the share of U.S. publications with citations from abroad increased from 47 percent to 56 percent. Countries also specialize in different fields of research, with the U.S., EU and Japan publishing heavily across the medical and biological sciences, while India and China focus on engineering. 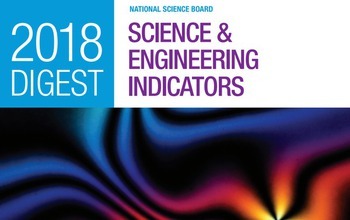 Science and Engineering Indicators is the most comprehensive source of high quality federal data on a wide range of topics that include trends in global R&D investments and knowledge-intensive industries, K-12 and postsecondary STEM education, workforce trends and composition, state level comparisons, public attitudes and understanding, and invention, knowledge transfer and innovation. Related products — including state fact sheets — are available on the Indicators 2018 resource page. The National Science Board and the National Science Foundation’s Director jointly head NSF. NSB identifies issues critical to NSF’s future and establishes the Foundation’s policies. The NSB also provides the President and Congress with Science and Engineering Indicators,a biennial report on U.S. progress in science and technology. Members are appointed by the President for six-year terms and selected for their eminence in research, education and records of distinguished service.